Leidos, a national security, health and engineering solutions company, was awarded a prime contract, Behavioral Epidemiology Assessment Research (BEAR), by the Naval Medical Logistics Command to provide research services for multiple behavioral health and epidemiology projects that support the Naval Health Research Center’s (NHRC) Behavioral Sciences and Epidemiology Department. The single-award cost-plus fixed-fee (CPFF) contract has a one-year base period of performance, four one-year options and a total contract value of approximately $7.3 million, if all options are exercised. Work will be performed primarily in San Diego, Calif. The NHRC’s Behavioral Sciences and Epidemiology Department is dedicated to the study of behavioral trends that impact warfighter readiness. The department examines operationally relevant issues affecting personnel such as combat and operational stress, posttraumatic stress, misconduct, substance use, suicide and career-span health and wellness issues. Under this contract, Leidos will conduct behavioral and epidemiological investigations that address these and other deployment-related health issues. Specific examples of these studies may include determining factors related to the onset of mental disorders in military personnel; mental health surveillance of combat-deployed personnel; assessing the effects of adverse lifestyle behaviors on health, performance, and healthcare costs; and investigating the effects of acute stress on military personnel. Smiths Detection has received a $42 million follow-on production order from the U.S. Department of the Army for Chemical Biological Protective Shelters (CBPS) to equip the National Guard. CBPS systems are mobile medical shelters — designed to military specifications — highly resistant to chemical and biological threats. They provide a chemical/biological agent free environment in which to administer healthcare without the need for protective clothing and act as a safe haven for patients. CBPS systems are manufactured at Smiths Detection’s U.S. headquarters in Edgewood, Maryland. This video provides a brief overview of some of the key benefits of the Smiths Detection Chemical Biological Protective Shelter Model E1 (CBPS-M8E1). This highly mobile, self-contained collective protection system provides a contamination free, environmentally controlled working area for medical combat services, combat service support personnel and emergency response teams to work freely without continuously wearing chemical-biological protective clothing. For more information and technical specifications of the CBPS M8E1, please visit:http://www.smithsdetection.com/index.php/en/products-solutions/integrated-systems/63-integrated-systems/cbps-m8e1. At the 2013 Military Health System Research Symposium (MHSRS) in Fort Lauderdale, Vidacare Corporation will be launching the T.A.L.O.N.TM (Tactically Advanced Lifesaving Intraosseous Needle) Intraosseous Vascular Access System for military use. The T.A.L.O.N. system is a groundbreaking single needle solution for vascular access that provides combat life savers and medics with rapid and accurate manual IO access to seven FDA cleared IO sites – proximal tibia (below the knee), distal tibia (ankle), proximal humerus (shoulder) and the sternum. The T.A.L.O.N. system is the first IO system to meet all Committee on Tactical Casualty Care (CoTCC) recommendations for IO devices. T.A.L.O.N. provides rapid vascular access through the intraosseous (inside the bone) space and helps deliver vital fluids and drugs through this space, the body’s largest non-collapsible vein, to injured soldiers safely and quickly. T.A.L.O.N. is a non-powered vascular access option that complements Vidacare’s powered EZ-IO® Intraosseous Vascular Access System that is widely utilized in combat medicine today. This system is designed to provide battlefield responders a tactical advantage needed in the combat zone via its lightweight and minimal cube design, proven ability to gain vascular access quickly and safely, and its versatility because no additional intraosseous vascular access gear or tools are needed. As with any vascular access site, the IO insertion site should be monitored frequently and the system should be used only when anatomical landmarks can be clearly identified and in accordance with the T.A.L.O.N. system’s instructions for use. The T.A.L.O.N. system will be commercially available in the United States starting in early Q4 2013. “This system is designed specifically to address the needs and concerns of military personnel treating patients under strenuous conditions. The T.A.L.O.N. system will help achieve vascular access and save lives when seconds count. Also its design is ideal for the combat zone,” said Mark Mellin, President and CEO of Vidacare Corporation. Tobyhanna Army Depot has joined forces with Rock Island Arsenal, Ill., to produce 72 new M997A3 Humvee Ambulances for the Army National Guard. The guard is set to receive 500 ambulances, which will augment, and in some cases replace, the older M996 two-litter ambulances and M997 four-litter models, according to Army Guard officials. The new ambulances are the result of a shortage of tactical ambulances Army-wide. The M997A3 ambulance configuration will be specifically for the Army National Guard to meet its homeland security and natural disaster relief efforts. The first 45 units are scheduled for fielding in March 2014. The new models feature a variety of upgrades from the ambulances they replace, including an improved drive train and electrical components, interior improvements inside the ambulance cabin and elements that provide for greater storage of medical equipment, said Jason Evans, an electrical engineer who works in the Production Engineering Directorate’s Engineering Design Development and Manufacturing Division. Rock Island was awarded the contract to manufacture the new M997 models starting with a Low Rate Initial Production run of 72 units. Tobyhanna signed on to provide some mechanical and electrical components. Officials have expressed an interest in the depot doing more during full-rate production, Evans noted. The first shipment went out in the middle of June, according to Dawn Heffler, production controller, Production Management Directorate’s Manufacturing Support Division. Shop personnel are fabricating 22 different cable assemblies. The kits are sent to Rock Island for installation. The funds arrived in March and fabrication began in April. Heffler oversees the project by working with several depot organizations and acts as a liaison between Tobyhanna and the customer. Electronics Technician Jeremy Howells commended everyone for taking on the challenge of a new workload without hesitation. There’s been a steady flow of information between the depot and Rock Island, according to Joe Kalinowski, work leader. “The constant contact and exchange of information was vital to the success of this project,” he said. The Army’s M997 series ambulances are equipped with basic armor and used to transport casualties from the battlefield to the medical aid stations. The unit can be heated, ventilated or air conditioned, depending on environmental conditions. The ambulances are capable of transporting up to four litter patients, eight ambulatory patients, or a combination of litter and ambulatory patients and still have room for medical personnel, equipment and a driver. FLIR Systems, Inc. (NASDAQ: FLIR) announced today that it has been awarded a two year blanket purchase agreement from the U.S. Army to support the MEDEVAC program. The blanket purchase agreement is valued at $81 million and is for the Army MEDEVAC Mission Sensor (MMS) configuration of FLIR’s commercially developed military qualified Talon product, a stabilized 9-inch multi-sensor gimbal system. The Talon MMS will be installed on the Army’s fielded and new MEDEVAC Blackhawk helicopters. An initial delivery order of $19 million was received. Work under this award is expected to be performed out of FLIR’s facility in Billerica, MA, with shipments under the initial delivery order expected to be completed by 2014. Source : Flir Systems Inc. It has been said that eyes are the windows to a person’s soul. Additionally though, they are also the gateway to a person’s identity. Many Soldiers who have deployed to Iraq or Afghanistan are familiar with biometrics — which is the collection of iris scans, fingerprints and facial images used to identify an individual. In fact, forensic science has been around for nearly 100 years, with fingerprints used as a primary means of identification. Today, fingerprints, iris scans, DNA and other biometric traits are used to identify and apprehend persons of interest. “Many in the military, to include Army intelligence analysts, are unfamiliar with how those collections are planned, exploited, analyzed and turned into a valuable source of information used to protect friendly forces, identify persons of interest for questioning or targeting, provide security to local populations, and protect our homeland,” said Gregory Sieminski, chief, Identity Intelligence Division, National Ground Intelligence Cente, known as NGIC. In this digital age, many believe the global proliferation of biometric technology and the ubiquity of identity information present a huge and growing intelligence opportunity for today’s generation of Army analysts. “Biometrically Enabled Intelligence provides an analytical baseline by resolving identities through high-confidence biometric matching and fusion with other sources of intelligence to positively identify the person in question,” said Cathy Moore, senior intelligence analyst, Biometrics Division, NGIC. “The Biometric Enabled Watchlist — a Defense Department-wide service managed by NGIC — is the tool that gets the critical conclusions about threat identities from BEI out to the field,” Moore said. “It places biometric intelligence at the fingertips of our Soldier-sensors by providing the ‘so what’ for the operator at the point of encounter,”. For example, during a biometric screening, a watchlist “hit” might reveal that a local national has ties to an insurgent network, leading to denial of his employment at a U.S. military installation overseas. An Army all-source analyst, while conducting intelligence preparation of the battlefield, develops geospatial plots of biometric and other data that reveal the operational patterns of an insurgent improvised explosive device network operating in his unit’s area of operations. A brigade combat team security officer plans focused biometric enrollment operations in conjunction with routine patrolling. How are these events related? They are a few of the ways biometrics are being integrated into Army all-source intelligence analysis, where it enables warfighters to deny anonymity to adversaries. Thanks to its proven success in both Iraq and Afghanistan, this capability has grown well beyond its wartime roots. Biometric technology, and its fusion with all-source intelligence, is proving highly relevant to enduring and emerging 21st century threats where individuals seek to conceal their identity. From Somali pirates to weapons of mass destruction proliferators, human identification is a critical enabler to the full range of military operation. Like analysts across the U.S. Army Intelligence and Security Command force, Mountz has learned that BEI can deny foes that advantage. AgustaWestland, signed a contract for a fleet of AW139 twin engine helicopters to equip the Saudi Aeromedical Evacuation Department of the Ministry of Defence of the Kingdom of Saudi Arabia. The helicopters will be configured with a dedicated aeromedical interior to perform air ambulance operations, with deliveries starting in 2013 and being completed in early 2014. 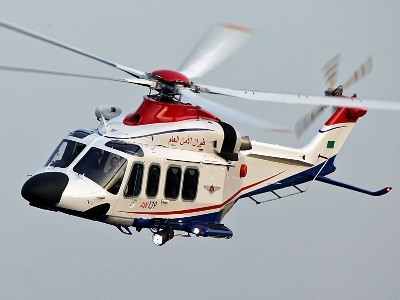 It is the first order for the AW139 to be placed by the Ministry of Defence of the Kingdom of Saudi Arabia and continues the success of the AW139 in the Kingdom, where it is already performing demanding missions with other prestigious operators. The AW139 has been recognised by many of the world’s leading aeromedical organisations as the most capable helicopter in its class, thanks to its outstanding performance and the easily accessible large cabin for patients and the medical team. The AW139 will further enhance the aeromedical evacuation service in the Kingdom of Saudi Arabia, helping it to save lives and deliver medical treatment to those in need in the shortest possible time. With more than a 130 AW139s sold in the Middle East region, the AW139 is the market leader, offering new standards in terms of state-of-the-art technology, performance in the most demanding weather and environmental conditions and low operating costs. The AW139 is the only helicopter in its class to meet the latest civil safety standards and features Cat. A (Class 1) performance, a 30 minute run dry capable main gearbox and an advanced Health and Usage Monitoring System (HUMS). The AW139, together with the AW169 4.5 tonne light intermediate and the AW189 8 tonne class twin engine helicopters, is part of the AgustaWestland Family of new generation helicopters which posses the same high performance flight characteristics and safety features as well as sharing a common cockpit layout, design philosophy and maintenance concept. This commonality will allow more effective operations for customers operating helicopter fleets across the 4 to 8.5 tonne categories. General Dynamics UK has been awarded a £4 million contract by the Ministry of Defence to deliver the British Army’s first Systems Information Exploitation / Health and Usage Monitoring System (SIE/HUMS). General Dynamics UK will integrate the SIE/HUMS solution into 578 vehicles covering six protected patrol vehicle (PPV) variants in the operational training fleet with the aim of improving the availability and utilisation of those vehicles. The vehicles to be integrated are Mastiff, Ridgeback, Husky, Jackal, Coyote and Wolfhound, all of which General Dynamics UK is familiar with through its Bowman integration activity. General Dynamics UK won the competition to provide SIE/HUMS based on the cost-effectiveness of its solution, taking advantage of General Dynamics UK’s excellent track record in delivering UOR programmes on time and on budget, along with the pedigree of integrating over 15,000 vehicles from the British Army’s fleet. General Dynamics UK’s SIE/HUMS solution will provide monitor on-board systems and automatically download data from each vehicle so that operators and fleet managers have accurate information to use in optimizing vehicle use and minimising maintenance. The visibility of vehicleperformance data will enable users to improve fleet availability thereby delivering better Army vehicle fleet-management capability. The data collected and analysed by the SIE/HUMS will range from engine management-system data such as oil and water temperature, speed, distance travelled, and performance, to information about shocks and vibration, excessive vehicle speed or high fuel consumption. Once such data is collected, statistical time-based analysis can help users identify potential problems. This data also will enable conditioned-based maintenance where lightly used vehicles receive less work, thereby saving the costs of unnecessary maintenance. As more data is collected, prognostics also will enable better preventative maintenance practices, reducing costs and increasing fleet availability. A key attribute of the General Dynamics UK solution is its ability to be modified through software configuration to record data as required, enabling specific items to be focused upon. In addition, it has been designed to be Generic Vehicle Architecture (GVA) compliant, enabling it to plug-and-play with other GVA-compliant devices to increase onboard capabilities, up to and including the type of complex electronic architecture used on SV. General Dynamics UK has played a central role in the team contributing to the MoD’s future Generic Vehicle Architecture DefStan 23-09 and has patented its electronic architecture solution. Electronic medical assets and records reduce delays in treatment and enhance healing. Battlefield medicine has advanced significantly since the days when surgeons used whiskey as an anesthetic, and in the last year several new technologies have rolled out to deployed soldiers facing physical or psychological disorders. The U.S. Army program responsible for fielding software and the hardware on which it resides is pushing the cutting edge of diagnostics and treatment to the tip of the spear. Personnel hope the effort will save lives and limbs not only by treating injury or illness, but also by keeping troops off the road in war zones. The Army’s Medical Communications for Combat Casualty Care (MC4) has the service’s Title 10 responsibility to field, sustain and maintain a joint software applications suite for combat medicine. The MC4 is the far-forward Army system used to capture health care information. Applications are developed by the Military Health System and provided to the various military services, which are responsible for placing them into their individual systems. The MC4 integrates the apps into hardware, adding Army-unique systems and apps, and then fields the packages to operational forces. “Army medical units don’t have hardware unless we provide it,” explains Lt. Col. William Geesey, USA, the MC4 product manager. Since beginning field operations in 2003, the MC4 has enabled the capture of more than 16.5 million electronic patient encounters in combat zones. The system-of-systems also has trained 61,000 medical staff and commanders and fielded 49,000 systems to 750 units with medical personnel. This includes Army National Guard and Reserve units as well as active components in 19 countries. One of the systems fielded by the MC4 in the last year centers on tele-behavioral health. It leverages commercial technologies available in theater to create a videoteleconference capability that enables mental health providers to conduct private consultations with soldiers at far forward operating bases who otherwise might go untreated. An Army division with as many as 10,000 to 15,000 troops spread over multiple locations may have only one psychiatrist assigned to it, meaning that either that single physician has to travel to all those places to provide treatment, or soldiers have to travel to the doctor’s location. Either way, troops traverse treacherous terrain. Through the videoteleconferences, care can be provided more quickly and safely. Col. Geesey says that information coming in from the field reports that 70 percent of the doctor-patient interactions resulting from the new technology would never have occurred without it. “When you’re at a forward operating base, you’re not going to get onto a road that’s dangerous or get on an aircraft to go see a psychiatrist who’s far away,” he states. With the system, soldiers can visit their local medical facility and have a consult with a mental health provider in another place. Also completed in 2011, the MC4 fielded a mild traumatic brain injury (mTBI) documentation capability and assessment tool. When a solider is exposed to an improvised explosive device (IED), a medical provider can administer a battery of tests to determine injuries. The results are documented in the electronic record that is at the heart of the MC4. Through this digital trail, all the medical care soldiers receive from the time they enter service through the rest of their lives is captured in one database accessible by military and Veterans Affairs Department (VA) health care providers. The result is faster diagnosis and treatment as well as an elimination of repeated tests or procedures. With the mTBI information recorded, medical practitioners can access the data if a soldier affected by a blast develops problems in the future. In addition to its immediate application, the mTBI tool also helps feed research and development efforts by providing data on thousands of soldiers affected by IEDs. “You can use that for developing treatments and also materiel solutions,” Col. Geesey says. Overall, he explains, MC4 systems are designed to focus comprehensively on the entire soldier. The mTBI and telehealth initiatives have a focus on the effects of IEDs on the human body, responding to a number of studies showing a correlation between higher incidences of IED exposure and elevated depression rates. Another recent MC4 update involved the fielding of a medical logistics capability to Army combat support hospitals for the first time. A hospital at Camp Dwyer, Afghanistan, became the premier facility in Southwest Asia to employ this Defense Medical Logistics Standard Support system, which serves as an automated medical logistics inventory management and property accountability tool. The fielding team consisted of MC4 and 6th Medical Logistics Management Center personnel. The MC4 is interested in taking advantage of the many Army and personal technologies available in the field and is in the midst of an initiative to make online training courses available on smart devices. The content includes interactive video and constantly updated documentation. Though the Army is still in the process of officially acquiring and fielding smart devices to soldiers, Col. Geesey explains that by his estimation based on personal observations and the observations of others who have deployed, the vast majority of soldiers carry their own laptops and smartphones in theater. Through these, they can access the latest MC4 resources. The initial version of the MC4 guide was available only in a PDF format accessible on computers via Army Knowledge Online. Lt. Col. T. Sloane Guy IV, USA (right), chief of surgery with the 47th Combat Support Hospital, Mosul, Iraq, reviews an image of a patient’s chest with specialists located at Brooke Army Medical Center at Fort Sam Houston, Texas. The operation showcased technology that connects deployed medics with experts back in the United States to provide the best possible medical care in the field. Moving forward, the MC4 plans to take the Army’s tele-behavioral health program and expand it to demonstrate a broader telehealth capability. During the next several Network Integration Evaluation events—the Army’s new method for evaluating and more rapidly fielding necessary technology assets into the field—MC4 personnel are scheduled to demonstrate that the concept can help medical specialists address the concerns of forward-deployed soldiers who lack access to such expertise at their locations. “The idea is to reduce the amount of time soldiers have to travel or take to be evaluated,” Col. Geesey explains. Already, the MC4 system was instrumental in a one-in-a-million surgery that helped an Iraqi receive the medical assistance he required. The surgeon in theater was able to consult via a videoteleconference with a specialist at Brooke Army Medical Center in Texas to conduct the procedure and save the man’s life. This telesurgery mentor initiative was led by the U.S. Army Medical Research and Materiel Command’s Telemedicine and Advanced Technical Research Center. Col. Geesey says the MC4’s telehealth efforts eventually could have applications across the Army, but for now the work is focused on units that have the fewest medical providers and specialists assigned to them. “MC4 really offers a tool that enables a provider to deliver better health care,” he explains. “It’s not a clinically invasive device that heals soldiers. What we primarily do is leverage emerging commercial technologies to support the deployed service member.” This support includes laboratory results, pharmaceuticals and X-rays. Keeping all the information collected electronically means that in emergency situations, personnel do not have to worry about sending the right paperwork with patients, and it eliminates situations where information may arrive too late or not at all. Having information stored and available electronically throughout soldiers’ lifetimes creates advantages in non-emergency situations as well in immediate life-or-death incidents. For example, a soldier who breaks his ankle while in service may require VA compensation for problems the injury causes later in life. With the captured information, everyone can validate a claim more easily. Access to the information also helps protect troops from overexposure to radiation because of unnecessary X-rays and informs doctors about how often patients have been seen for certain complaints regardless of where in the military they sought care or who provided it. The MC4 soon could have even more pieces of data to manage if MRI devices are fielded in theater. Though the office is not responsible for moving the devices to forward locations, it would serve as the information technology enabler for synching the medical images from the machines with soldiers’ electronic medical records. Lt.Col. Crispo was the medical officer responsible for the Italian Military Health in Afghanistan. In this interview he explains the duties of the J-MED and the health situation of the country.